Last week we arrived in Nairobi on the evening of October 24th, via Amsterdam. The following day we left for Tenwek hospital, which is about 400 kilometers, or a 4-hour drive from Nairobi. The hospital is mostly frequented by the Maasai, an indigenous African ethnic group of semi-nomadic people located in Kenya and northern Tanzania. Due to their distinctive customs and dress, and their residence near the many game parks of East Africa, they are among the most well known of African ethnic groups. Tenwek is an amazing place with so much need. I have learned to be grateful in my life but seeing such a place reaffirms my gratitude and makes me realize that in the United States we are blessed beyond belief. Still, the people are very nice and in no way have we felt threatened as you can see on the attached picture of a shopping area. The native languages here include Swahili, Kypsigis (a tribal dialect), and some English. Most people are still living in metal roofed mud huts with no running water or electricity. But the hospital compound is nicer than the towns in the surrounding area. We were warned by the orthopaedic chief of staff about “waste time” from the hospital organization’s standpoint and learned that expressions like “TIA – This is Africa” have made it into the common vernacular. The operating rooms were relatively nice and equipped with machines from a variety of medical device companies. Most ortho surgeries are traumas related to farm injuries and motorcycles. Intramedullary tuberculomas (IMTs), which cause spinal cord compression due to vertebral involvement, are also very prevalent. The following entries describe activities in the operating room where the team did a total of eight spinal procedures, including: anterior cervical corpectomy, anterior lumbar interbody and fusion, translaminar interbody and fusion, and simple decompression and laminectomy. Thirty minutes after arriving at the hospital, and during our hospital tour, a young man was brought in with his hand almost detached to his arm. The NuVasive Spine Foundation Team helped Dr. Helen Cappuccino to quickly operate on the young man and restore function in his arm. Pat and I jumped in the operating room to assist Dr. Cappuccino in closing the wound. This case gave us a clear idea about what the rest of our days at Tenwek Hospital were going to be like. During the first spinal case, a two-level TLIF, we heard a big roar of clapping and laughing from the other room. A baby had been born! You’d be tempted to think of how crazy all of these people are to laugh and celebrate for another baby to be born into such poverty. But then on the bright side you’d realize that the baby boy was a gift from God so maybe, just maybe, he will be someone who helps guide Kenya out of poverty. Interestingly enough, I can’t get over the people who have dedicated their lives to this place. There is Dr. White, a very funny and warm thoracic surgeon who is the chief of staff. He has 3 young kids and they are always running around the hospital building barefooted. He unabashedly tells how he was drawn to this place by God but admitted that by no means did he receive a telegram or fax from the heavenly place. 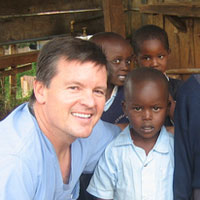 Dr. White was born in the Congo where his father was also a missionary. Additionally, there is Dr. Dan Galat, a 37-year-old ortho surgeon from The Mayo Clinic, who got his medical degree from Ohio University. Dr. Galat was the jack of all trades. He and his young wife Heather have dedicated their lives to help the population in Tenwek. Dr. Galat also has a long story on how he found himself a full-time ortho surgeon in a town of mud huts, surrounded by Swahili speaking people. The short version of the story is a clear “calling from God.” I was helping both doctors with translation in the O.R. and during clinical visits. Dr. Helen Cappuccino did a below knee amputation (BKA) on day two. Right after the first spinal procedure, Pat and I scrubbed in from there on. We are grateful to be part of this mission. Day two at Tenwek started earliest for Dr. Helen Cappuccino, as she was on call and was alerted in the night to treat a closed head injury from a motorcycle accident. Like a trooper, she was on top of it but like many of the problems in Africa they had no way to tell (no MRI onsite) where and how severe the injury was without an exploratory craniotomy. Not something that anyone would ever opt for, but in the backcountry of Kenya, or Africa in general, one has little choice. Sadly, the patient passed the next day as they could not stop the brain from swelling. At the hospital gate there is a sign that reads “We treat, Jesus heals.” No wonder why this hospital receives missionaries from around the world coming to help these people. On day three, we started with the first surgery around 7:00 a.m. Prior to starting the two planned surgeries, Andy and Helen Cappuccino went to round on the patients that were still in the ward. Pat and I prepared for the cases and started to organize the equipment. We completed two complex cases including a patient named Freddy. We have found Freddy crippled with a progressive paraparesis due to post-TB infection. For the last five months, Freddy had been lying down on a small bed and waiting for a miracle to happen. His brother helped him with basic needs but he was getting anxious after five months. Freddy had a vertebral body compression in his spinal cord – he had no feeling or use of his legs below his umbilicus. With all hands on deck, the team was able to deliver front and back surgery on Freddy. We were anxious to finish the case on time and not miss our flight back to the States. The two cases on day three were both very challenging and ended well, especially since we have received pictures of Freddy walking with his wife in his Sunday best. Dr. Dan Galat had organized a closing ceremony with speeches discussing how thankful they were for the expensive implants and assistance from the U.S. surgeons. The multiple speeches and thoughtful gifts were an impressive display of attitude of gratitude from our Kenyan hosts.